Every member of your Investment Club can view a summary of the club's investment portfolio online at anytime, including the value of their individual units, daily change in unit value, stock charts and more. TimeToTrade can be accessed by all investment club members from any computer or mobile phone that has internet access. All of this and more is free when you open a funded Investment Club Trading Account. When you create a TimeToTrade Investment Club Account, you and all of your Investment Club members will have access to your own private password-protected website. Membership and access to your Investment Club is by invitation only. The following is an example of a typical homepage, where all members can quickly view key information relating to the performance of your club's investments, unit value and accounts. Membership and access to your Investment Club's private webpages is by invitation only. You choose who to invite, define their club roles and responsibilities and have complete control over each member's access rights and user privileges. The TimeToTrade Investment Club Accounting system is web-based, so everything is managed on-line. As there is no software to download, Executive Committee and Treasurer roles and responsibilites can be easily re-assigned between club members without the need to transfer data and software between computers. TimeToTrade automatically back-ups up your data daily - so you don't have to. The software is intuitive to use and transactions are easy to input. The system supports shares, funds, option, forex and spreadbet transactions, with automatic portfolio updates for and extensive range of UK, US and European shares including Currencies and Precious Metals. You can set up multiple ledgers in different currencies with a variety of transaction types (including long, short and Option position management). All club members can have access to the private Investment Club website so they can immediately view the club's portfolio, accounts and the value of their units without having to request the information from the treasurer. TimeToTrade's web-based software allows you to quickly and easily record member subscriptions and withdrawal payments. Member subscriptions can be used to buy club units on any day and for any amount, giving you and your members complete flexibility. 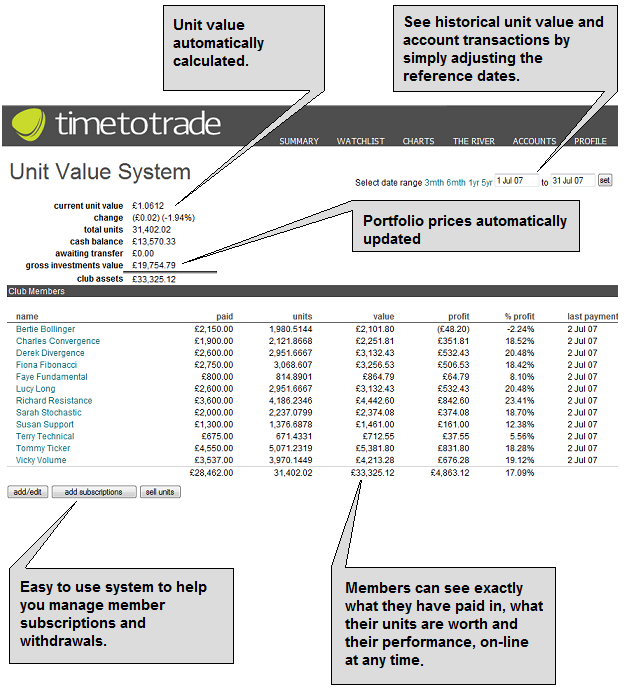 And to make life easier, TimeToTrade automatically values your portfolio for you and calculates the unit value and number of units purchased or sold - a considerable time saving for any Treasurer. If you open a Club Member Trading account, member subscriptions and withdrawals are used to automatically update the Unit Valuation System. When combined with your portfolio, dividend and share reorganisations being automatically updated, this takes a lot of pressure of the Club Treasurer, freeing up more time to select investments and manage your portfolio. All club members can be given access to your private Investment Club account so they can immediately view the club's portfolio and the value of their units without having to request the information from the treasurer. 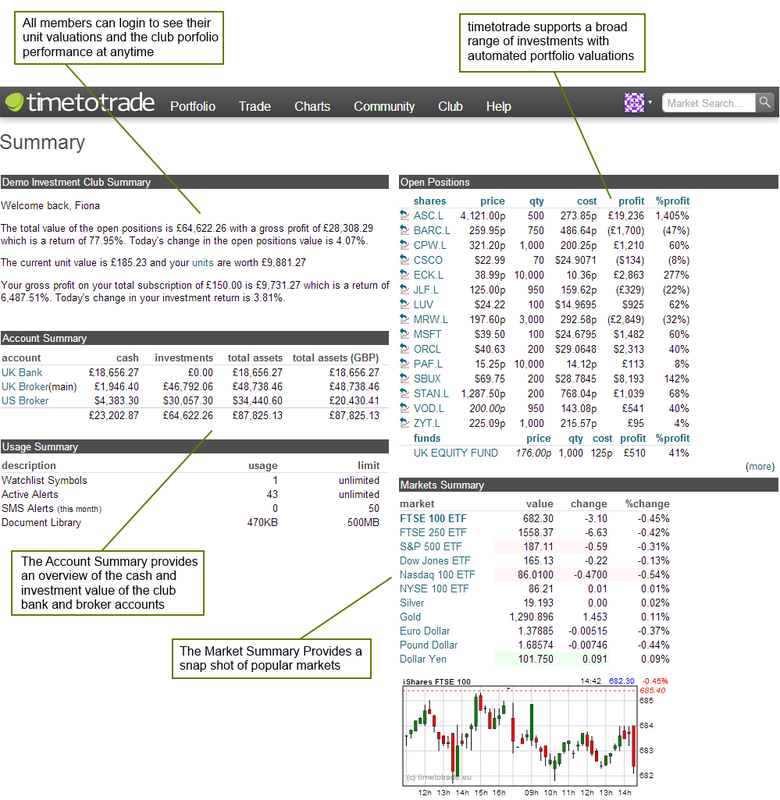 With TimeToTrade's Investment Club software you and all of your club members will have access to price and technical indicator charts for UK, US and European markets, on-line, at any time (real time and delayed data). 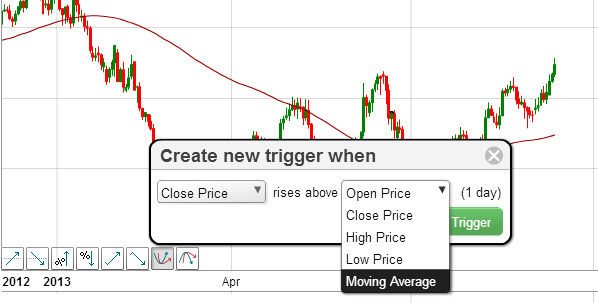 Your members can also create alerts against price and a variety of technical indicators (Stochastic, MACD, Moving Averages, RSI, Bollinger Bands) which can be sent to your club Traders' email or mobile phone - so that your Investment Club doesn't miss trading opportunities in between club meetings. Are you looking for new club members? Or looking to meet other local clubs in your area? 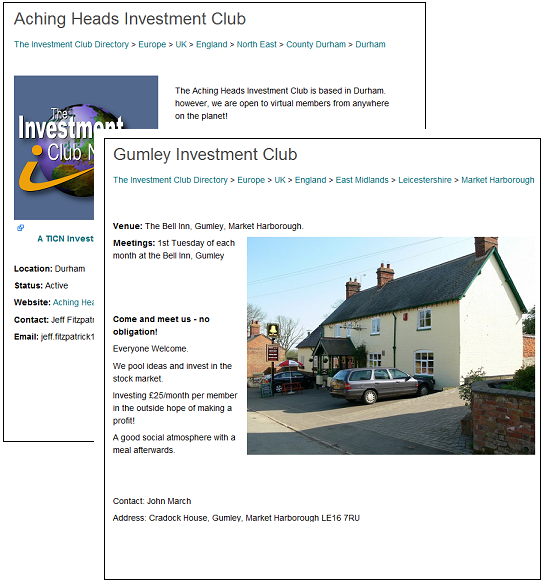 Send us details about your Investment Club and we'll add your club to, giving you your very own Personalised Club web page. The Investment Club Directory is visited by hundreds of investors every day looking to find clubs to join, so send us your details and we'll help you recruit new members: Contact Us. UK HMRC Form 185 shows each member’s share of capital gains or losses and also sets out his or her share of income derived from UK dividends; overseas dividends; income taxed at investment rate (eg bank account interest); income taxed at investment rate (eg property income distributions (PIDs) from authorised REITs). The club’s income and capital gains/losses must be apportioned among the members and there are special rules for calculating the share of members who join or leave during the year and reported to the HMRC. With so many changes in tax rules in recent years, preparing your club tax returns can be quite onerous - so letTimeToTrade take care of it all for you - from managing your unit valuation system to apportioning gains and printing returns. 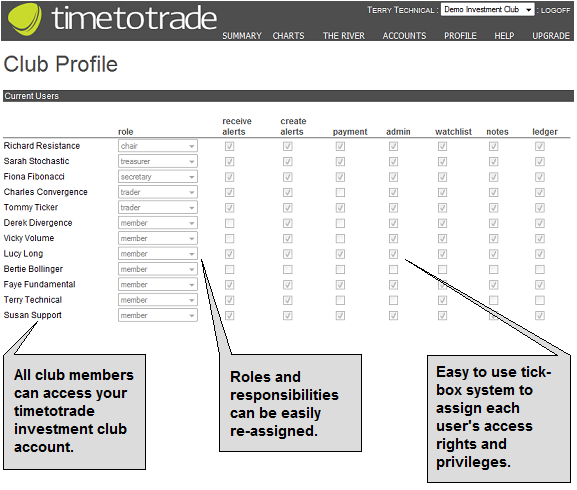 The TimeToTrade software gives you the choice to apportion income, gains and losses between club members using either the Simple Unit Holding or Time Weighted Average methods. 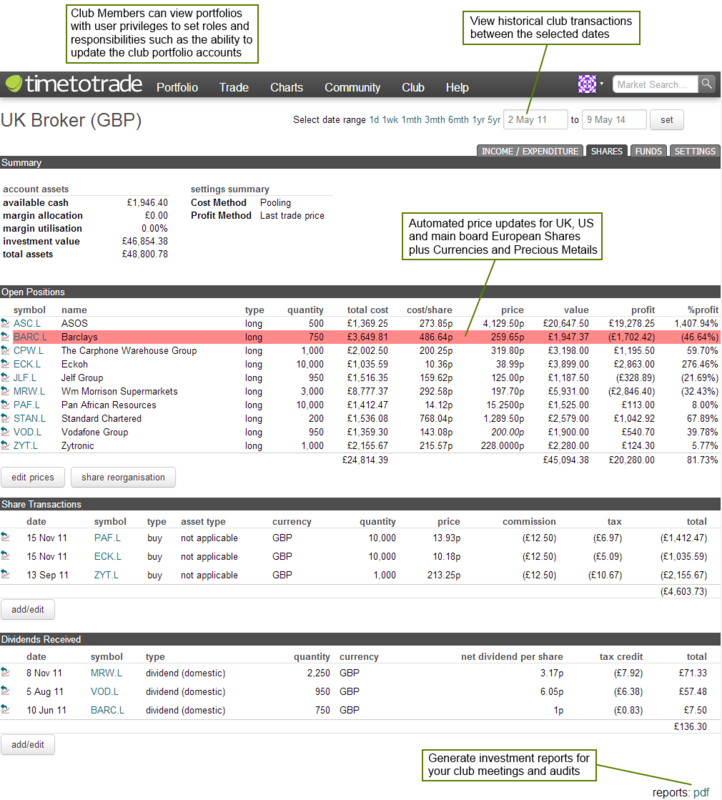 The TimeToTrade accounting system supports UK HMRC Capital Gains Tax rules (including same day, bed and breakfasting share pooling) as well as the pre-2008 taper and indexation rules. 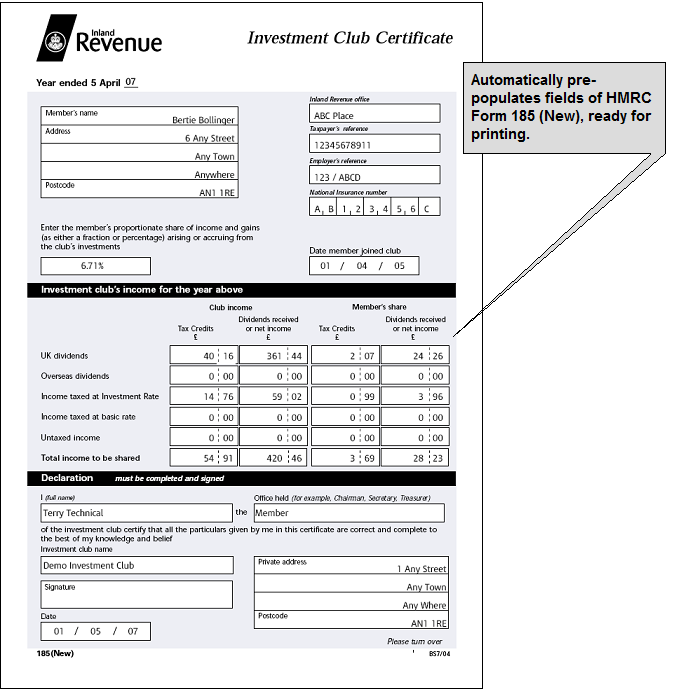 UK Investment Club Tax Return Form 185 (new) can be generated at the click of a button - a considerable time saving for any Treasurer. 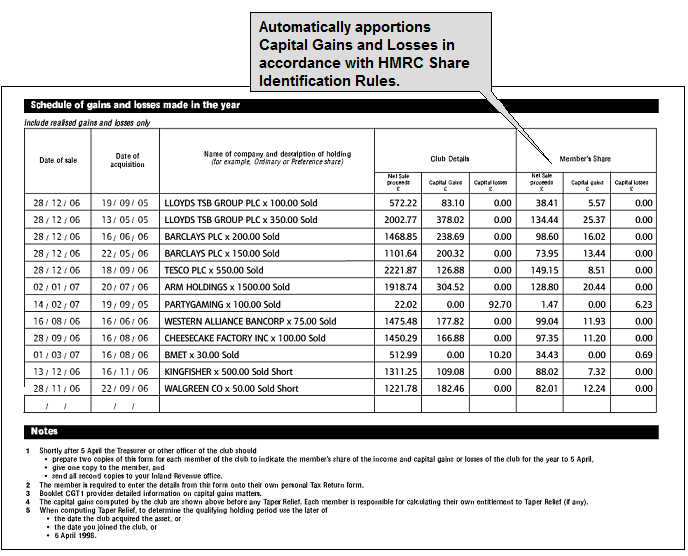 [*] Form 185 and the UK Capital Gains Tax Calculator are part of the Live Account Features - you will need to <a href='https://timetotrade.com/signup.php Open a Trading Account] to access these products.